SweetPro offers two NON-Molasses lick blocks—Cattle Starter or Cattle Kandi—which are designed for essential fortification of starting calves, receiving cattle, and goat requirements for vitamins A, D & E plus protein, calcium, phosphorus and trace elements including selenium. Kaf Starter is a fortified protein supplement for starting LIGHTER calves and receiving cattle. For our bison customers we recommend feeding the SweetPro cattle products. We have found that bison do best on one of the following SweetPro tubs: Kaf Starter, Kaf Kandi, Powermate or SweetPro16. This unique, patented formula consists of fermented grains (barley malt, oats, wheat and flax), yeast, live enzymes, and probiotics and prebiotics to improve animal health, milk production and weight gain. Note: The horn fly control ALTOSID® IGR may be added to any of the SweetPro tubs. This may provide effective fly control for 3 ½ to 4 cents per head/day. During horn fly season, without fly control, daily average gain may be reduced by 0.25 lbs per hd/day. But an Altosid IGR (Insect Growth Regulator) feed-thru fly control investment of $4.50 to $5.50 per cow/calf pair for a summer feeding season will yield returns from 6:1 to 10:1. Sold in 225lb lick tubs and in bulk. All our SweetPro products break from the tradition of molasses blocks, and provide your livestock with healthier supplements that help their digestive systems perform at their natural best. The benefits from our blends of ingredients and advanced processes, supports animals that grow stronger, faster and avoid many of the health problems with which bison, cattle, elk, goats, horses, sheep and yak owners traditionally have struggled. The result is healthier animals, better profitability, feed cost savings, less wasted labor and lower overhead. SweetPro products give you a simpler approach to managing your livestock and your business, through better feed supplement science. 1. SweetPro blocks use Condensed Distillers Solubles with much higher protein and nearly 10 times the fat as molasses, plus enhanced aroma and palatability. 2. Energy in SweetPro blocks comes from complex carbohydrates instead of the simple sugars of molasses. This supports resistance to digestive disruption from sugar and starch (No Negative Associate Effect) digestion on the microbial populations which digest fiber in the rumen, keeping rumen pH high for health support. 3. Supported overall digestion and excellent feed efficiency with SweetPro’s fermentation feed ingredients, rich in yeasts and volatile organic acids that support rumen fermentation. In SweetPro blocks, there’s virtually no starch or sugar and minimal NSC (non-structural carbohydrate). Instead, the focus is on complex (structural) carbohydrate and high by-pass protein value in the distiller’s grain carrier. We then emphasize a top quality vitamin and mineral package with complex organic trace minerals to maximize bioavailability. Your cattle not only get the extra benefit of the supplement’s ingredients, but they also get up to 25% more out of the rest of their feed. 4. The safe, protein sources of SweetPro blocks include high rumen by pass ingredients to give calves, cows, bulls and goats an extra boost. 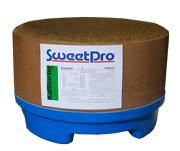 No Urea is used in any of the SweetPro products. 5. SweetPro blocks are fortified with Vitamins A, D and E, and a balanced blend of chelated trace minerals, to supplement lower quality hay, straw and stover. Daily intake will vary depending on forage quality and nutritional needs. Expected range of consumption is from 0.5 to 1.5 lbs. per head per day. There may be an adaption period whereby animals will fill in their nutritional gaps, but should level out after one or two tubs. If consumption exceeds 1.5lbs per head per day step up to the Kaf (Cattle) Kandi. Consumption levels vary depending on the time of year, weight/condition of bison and forage conditions. One tub per 25 head of bison. Place away from water source. Tubs can be space fed. Place the appropriate number of tubs with the desired group of bison assuming a consumption rate of 1-1.5 lbs. of product per day. For example, if the tubs are expected to last for 7 days, then don’t place new tubs in pasture or feeding area until this day has been reached. The product will stay in the animal’s system for multiple days even after the feed is gone. Bison Friendly Base: Bison prefer to maintain steady eye contact with their surroundings and will not put their heads too far down into feed containers. SweetPro’s patented base is ideal for the feeding instincts of bison. Its low profile design and biodegradable cardboard sides allow bison to eat it completely to the bottom, without hesitation or leftover product. Molasses lick block containers need higher sides to retain their melted product during summer heat. 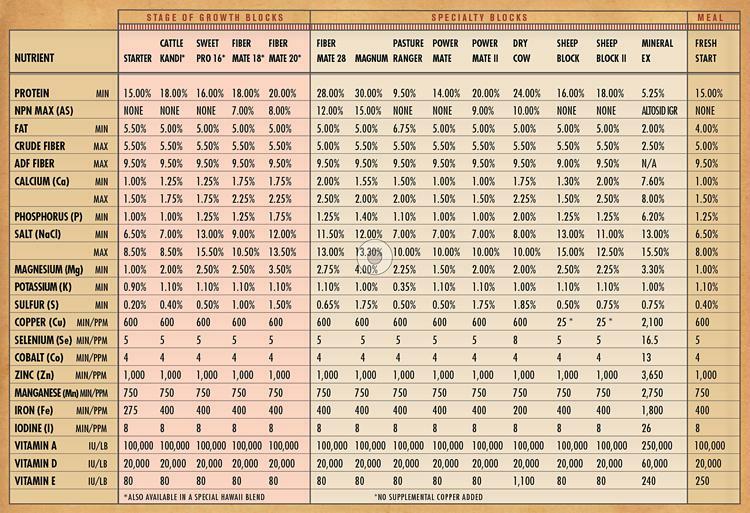 So bison only eat the upper part of those blocks. SweetPro’s all-season solid supplement blocks won’t melt in summer or freeze in winter. They’re perfect for bison.